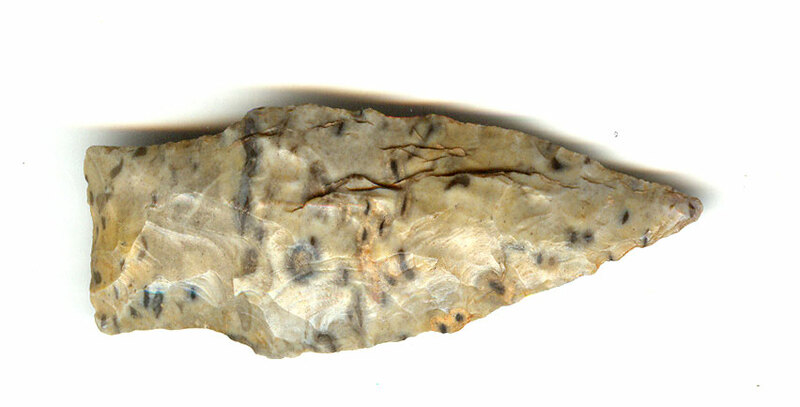 A Small Size, Colorful, Visibly Aged And Anciently Use Sharpened, Nicely Made Scottsbluff II Point That Exhibits Surface Sheen Aging And Stone Coloration Patination, Correct Rolled Basal Stem Edge Hafting Dulling, Correct Style Blade Flaking, Correct Material And Manufacture For The Area Found. Found Near The Saline River. Many Of The Small, Scottsbluff II Points Are Found Near The Town Of Dierks, Arkansas, Often In Groups On Early Sites. The Type II Scottsbluff Points Can Have Blade Edge Beveling, A More Defined Stem With A Less Pronounced Early Style Blade Flaking. Includes A Ken Partain Certificate Of Authenticity.